"What do you mean you have a dagger in your house? Where did that come from?" Its an ornament.......that just happens to be very sharp! 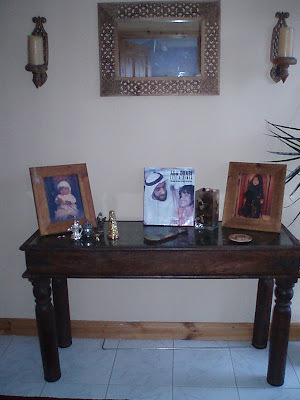 After living for five years in the Middle East, it's only natural that I would have amassed an array of Arabic bits and bobs. I didn't want my whole house to resemble a harem! Their furniture looks fabulous when it is bathed in glorious sunlight which bounds off the brilliant white walls and reflects off their marble floors. It doesn't have quite the same effect in the dull and dismal excuse of Irish sunshine. 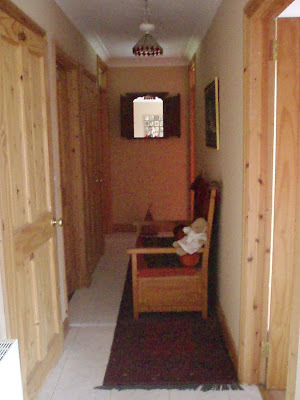 So I have restricted my Abu Dhabi belongings to the hallway. You can see Arabic perfume bottles, dishdash-clad teddy, Omani window/mirror, door converted into a table and a magic carpet. Very handy during an oil crisis. 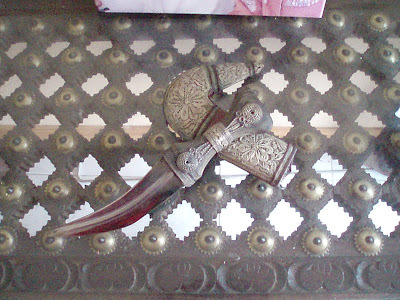 And of course, an Omani dagger. I will indeed use it.........and ask questions later! I've just realised, whatever way the light was shining on the blade, it looks as if its covered in blood! I haven't used it yet, I swear, Your Honour! An eye for the straight guy!